Fabbioli Cellars, owned by Doug Fabbioli and Colleen Berg, has been in the works for over 30 years. When the Fabbioli’s moved to California in 1987, they had in the back of their minds the idea that they would find a piece of land and grow some grapes. What sounded easy on paper became quite the challenge. Knowing that their dream would not be fulfilled in California, they headed back East in 1997, taking with them the knowledge, skills, and confidence they gained while out West. In early 2000, Colleen was driving around with their youngest son when she stumbled upon a 25 acre parcel in the southern Lucketts area, just north of Leesburg in Loudoun County. The Fabbioli’s had been seeking land for a while, but were unable to find the right place, until now. Not only was this piece of land perfect for growing grapes on, it also filled many other concerns and needs for their family as a home. In 2001, planting began, along with building the house. The main planting was Merlot with a little Petit Verdot for blending. The passion that Doug Fabbioli has for making quality wines has been passed down from his paternal grandfather, Leone Fabbioli. When Leone made his wine in the basement of his Elmira home in the 1940’s and 50’s, he would take special care to sort the fruit, keep the lots of wine separate, and get to know the growers of the fruit before deciding to buy. 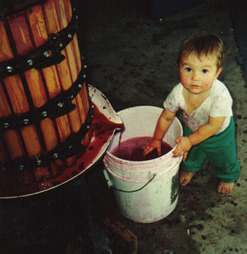 Doug employs the same time honored traditions of constant care, evaluation of quality, and modern scientific techniques to both grow the grapes, and make the wine at Fabbioli Cellars. Fabbioli Cellars has an incredible network of family, friends, employees, and volunteers that contribute year-round to their endeavors. To the Fabbioli’s, each person part of this network is comprised as extended family. From planting to pruning, crushing to bottling, and delivering to pouring, the team at Fabbioli Cellars is key to the success of their rapidly growing business. Bound by a common passion for fine wines, earth-friendly farming, and lasting friendships, everyone at Fabbioli Cellars revels in the challenges that each day brings while keeping confident that their efforts will not only bring them closer together, but will positively impact the experiences of each customer and the community, while showcasing the best in Loudoun’s rural economy. We hope to see you in the tasting room soon!